Copy a text from a dialog box is not an easy job without any third party tool because Ctrl+C become unusable due to non-selectable text on the dialog box. But with some third party tool, we can easily capture text from a dialog box. 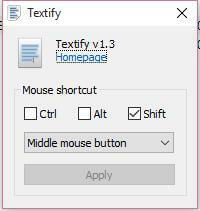 Textify is a freeware tool that shows with a short window about how one can copy some unselectable text from a dialog box. Textify is also easy to use portable tool that needs no installation. You need to just run the program and copy unselectable text with it and paste the text to use. 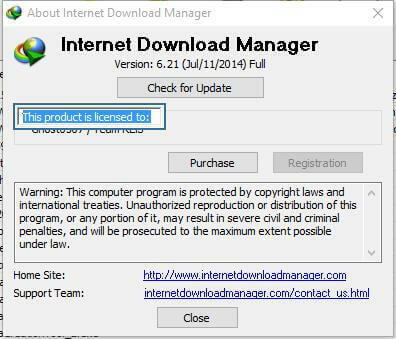 This program is compatible with all versions of windows 10, windows 8, windows 7, windows vista, and windows XP. This program comes with a minimal configuration. You need to press Shift + Mouse middle button to copy unselectable text on windows from any dialog box or system error message window. You can also replace Shift with Ctrl or Alt and middle mouse button with left mouse button or right mouse button. You can change the middle mouse button with left or right mouse button if not using a mouse with your laptop. 1. Leave open the dialog box from where you want to copy text. 2. Now, run Textify to copy text. 3. Press Shift + Middle mouse button to copy unselectable text after pointing the cursor to it. You will get below window. 4. Now you can select and copy the text from there. You can download Textify from here.